YANGON—A sculpture of State Counselor Daw Aung San Suu Kyi was auctioned at a charity event on Friday and went to the highest bidder for $80,000. The clay sculpture by Norwegian artist Merete Sejersted Bødtker had a starting price of 50 million kyats ($33,800) and was one of four pieces auctioned at the black tie charity auction event “Music & Memories” held in aid of the Daw Khin Kyi Foundation on Friday evening at the Sedona Hotel in Yangon. The highest bidder for the sculpture was U Sai Myo Win, chairman of Excellent Fortune Development Group, which has projects in mineral production, construction, real estate trading and infrastructure projects, among others. “This sculpture of Aung San Suu Kyi was created by me—on my initiative alone—in 2012, and cast in bronze in February 2013. I have donated one portrait to the non-profit Daw Khin Kyi Foundation, in trust that they live up to their goal and vision,” said sculptor Merete Sejersted Bødtker by email. 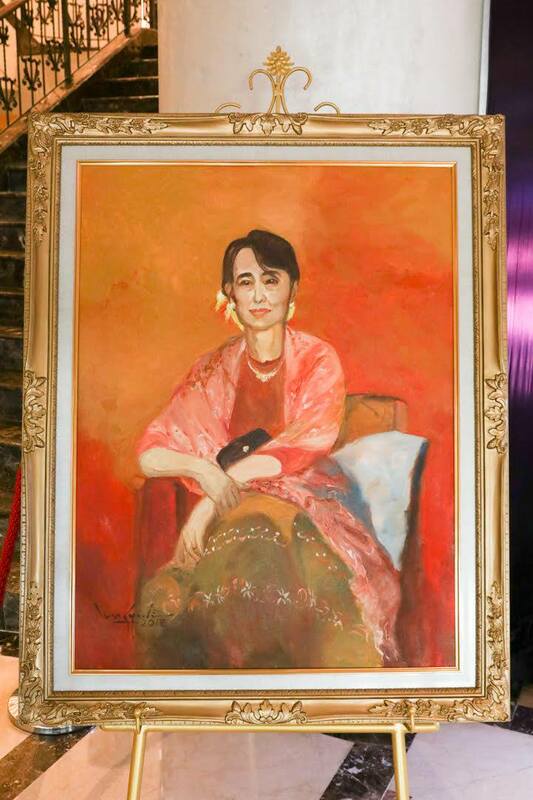 Another artwork, a portrait painting of Daw Aung San Suu Kyi by local artist U Lun Gywe, had a starting price of 10 million kyats ($6,700) and was sold for $43,000 to a public company, Shin Than Thu Co. Ltd. The Daw Khin Kyi Foundation is a charity established by State Counselor Daw Aung San Suu Kyi in 2012 in honor of her late mother Daw Khin Kyi. It is involved in fundraising and charity projects in the areas of health, education and development, mostly in rural parts of Myanmar. Friday’s event, attended by many of Myanmar’s affluent and famous characters, raised a total of $154,000 for the foundation. “We will use [the funds] for our three main long-term projects. We have a mobile libraries project which is working in 11 cities. The second project is our hospitality and catering vocational training school in Kawmhu, which has 130 graduates each year. The third major project is a wider humanitarian assistance project which involves things like disaster relief for flooding and earthquake victims, and infrastructure,” said U Thant Thaw Kaung, executive committee member of the Daw Khin Kyi Foundation.